Here’s some good news: we’re giving away another great prize! 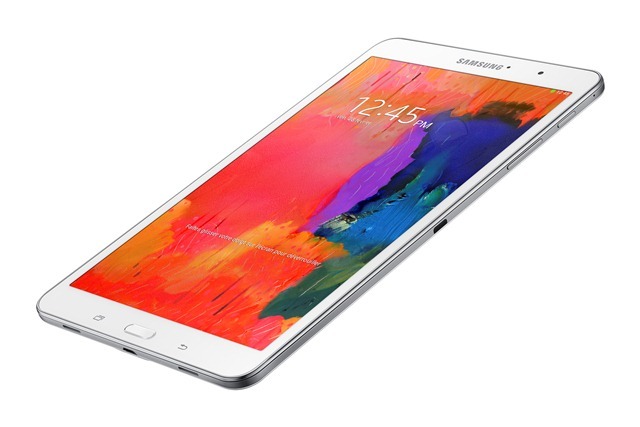 This time it’s the new Samsung Galaxy TabPRO 8.4 inch tablet! 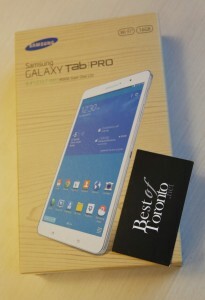 A winner will be selected at random to win the new Samsung Galaxy TabPRO 8.4 and a Samsung cover. Like Best of Toronto on Facebook and fill out the contest form. Catch up on all your favourite shows: The GALAXY PRO Series tablets have the highest resolution available, which is perfect for watching HD movies at the cottage. Stay connected no matter where you go: The Multi-Window feature that comes standard on all PRO Series tablets lets you run two apps simultaneously without having to toggle between them. It’s perfect for multitasking – letting you check in on social media while streaming content or replying to an email while browsing family photos! A device for the whole family: The new PRO Series also lets you run up to 8 separate profiles on the same device, which is great for ensuring that children can enjoy the tablets in a fun, safe environment without having access to information in the other profiles. Approximate retail value of the Samsung GALAXY TabPRO 8.4-inch – $419.99. Included in the prize is a matching Samsung case.